Now that your website is up and running, it’s time to start working on your Google PageRank (PR). My what? What is PageRank? PageRank, in simple terms, refers to the value given to your site by Google. Sometime ago this value was measured by link popularity, or the number of links pointing back to your site. (It was thought that the best and most relevant pages attracted the most links.) So the more links you have from other sites, especially those sites with a higher PageRank, the higher your website will be ranked by Google. And what does the high ranking do? Well, a number of experts consider PageRank to be the most important factor in establishing the relevance of a website or page, for each particular phrase, keyword, or search term entered on Google Search. Nowadays it has changed. Search engines like Google no longer rely solely on the quantity of links. They’re taking link quality and reputation into account, too. They analyze the linking page, see how relevant it is to keywords entered, and determine the level of importance the search engine will attribute to your website or page. How is PageRank measured? And what does that measurement mean? The PageRank ranking is measured on a scale of zero (0) to ten (10), with ten being the highest rank. When starting out, it may take a while to achieve a rank higher than zero. This is because once your URL is submitted to search engines such as Google, it may take weeks or months before it gets indexed. This may be an indication that you need to build good Web content and place backlinks on other websites. Though it may not look like it, a PR of 1 to 5 is actually quite an achievement. 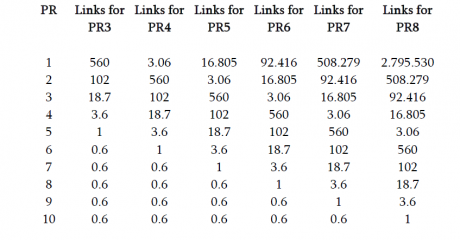 If you want to find out how many links are needed to achieve a certain PageRank, you can consult the table below. Say, if you want to achieve a PR of 5, then you need at least 560 PR-3 pages or 102 PR-4 pages linking back to your site. And so on and so forth. These are all just estimates, of course, that enable you to cover the “quantity” side of the PageRank equation. The challenge, then, for Webmasters, Internet marketers, bloggers, etc. is to increase their PR as quickly and as much as possible – with a mixture of efforts to enhance link quantity/popularity and quality/reputation. A high PR enhances the promotion of a website. How can this be done? Linking to websites with a higher PR will raise your site’s PR. Carry out a research for keywords relevant to your website’s content, and only link to sites whose PR you know. You could send an E-mail to webmasters requesting for a link exchange. Those that accept can raise your PR very fast by linking to your website. There are also loads of other ways in which linking out can help . It is essential to do serious keyword research using keyword search tools. With results on how many times a particular term has been searched online, you can optimize your site, avoid highly competitive terms, and make use of keywords that produce fewer – yet more desirable and efficient – results. Come up with keywords that are searched less, but are still popular. There are some tricks you can use to get ranked higher in regards to keywords, including changing some source code keywords. For instance, you can alter the title tag of your website to match optimized keywords you wish to use. You can also get ideas by looking at the source codes of other sites. It also helps to bold, italicize or highlight your keywords; it may not have a direct impact on your SEO campaign, but doing so over a long period of time can go a long way towards helping you achieve a higher PageRank, especially if the competition is not doing it. In addition, use competitive intelligence tools and find out what highly-ranked sites are doing: by applying your industry’s best practices, you just might eventually outrank the rest of the pack. About the author: Charles Mburugu is a professional content developer and entrepreneur. He often writes about real estate, finance, business start-ups and Internet marketing. In the past few weeks he has been writing for blogs where you can get the latest 123 inkjet discount coupon code and Network Solutions promo codes.